Navajo weavings that incorporate images of objects and people in their designs have slowly gained in popularity.Pictorial Rugs may include small representational images within a larger geometric design, or may consist primarily of a picture. Small pictorial motifs occasionally appeared on Transitional Period weavings and typically consisted of feathers, arrows, animals and other common objects that may have held some personal significance for the individual weaver. As the modern trappings of Anglo culture filtered onto the Reservation, strange new objects such as cattle, trains, American flags, and letters of the alphabet caught the fancy of some weavers. Navajo Pictorials made before the 1940s are relatively uncommon and usually command a premium price. After World War II, however, more weavers began making pictorial weavings, frequently filling a small rug with a single scene. Types that have been especially popular since the 1970s include landscape scenes which usually feature red cliffs or mountains, blue sky and clouds, juniper and pine trees, hogans, farm animals, trucks, and people. Another common format is called the Tree of Life pattern, consisting of a corn stalk rising from a Navajo wedding basket, with birds adorning the leaves of the cornstalk. 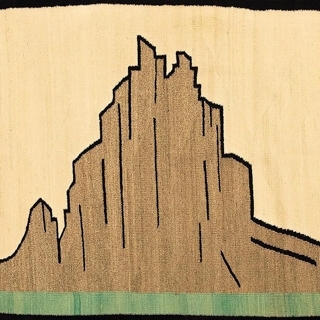 Rare and Unusual Navajo Village Scene Pictorial Rug by Ella Jean Ben with an Intentional Loose Yarn as a Horse Rein, 52" x 90"
Navajo Yei Pictorial Rug with Cornstalks c. 1940s, 59.5" x 31.5"
Navajo Yei and Tree of Life Rug, c. 1930, 85" x 132"
Navajo USA Pictorial Sampler, c. 1940, 14.75" x 24"
Navajo Train Pictorial Rug, c. 2000, 43.5" x 31"
Navajo Talking God Pictorial Rug, c. 1930s, 48" x 28"
Navajo Storm Pattern Rug with Yei Figure and Valero Stars, c. 1930, 72" x 44"
Navajo Single Saddle Pictorial Blanket with Flag Design, c. 1930, 23" x 32"
Navajo Shiprock Town Pictorial Rug, c. 1960, 38" x 59"
Navajo Shiprock Pictorial Rug, c. 1940, 41" x 49"
Navajo Pictorial Rug with Trucks and Houses, c. 1950s, 35" x 22"
Navajo Pictorial Rug of a Man's Initiation Ceremony, c. 1960, 52" x 72"
Navajo Pictorial Rug by Lillie Bahe with Farm Scene, c. 1970-80, 40" x 24"
Navajo Pictorial "Jethe's Home" Rug, 13.5" x 21"
Navajo Mountain Way Pictorial Rug c. 1920-30s, 60" x 60"
Navajo Miniature Rug with Cornstalk c. 1980s, 1" x 1.1125"
Navajo Miniature Pictorial Sampler c. 1980s, 4.625" x 5.75"
Navajo Miniature American Flag Rug c. 1980s, 2.125" x 3.5"
Navajo Lion Pictorial by Marie Tsinajinie of Gallup, New Mexico, c. 1980, 56.5" x 53.5"
Navajo Gallup Throw Pictorial Sampler with Single Figure, c. 1910s, 17" x 17"
Navajo Farm Pictorial Rug, c. 1980, 40" x 39.5"
Navajo Double Saddle Pictorial Blanket, c. 1925-30, 48" x 35"
Navajo Dalutso Pictorial Rug, c. 1970, 73" x 48"
Navajo Crystal Horse Pictorial Rug, c. 1900, 73" x 44"
Navajo Corn Yei Pictorial Rug c. 1920s, 124.25" x 66"
Navajo Corn Pictorial Rug, c. 1920, 18" x 16"
Navajo "H H" and Chicken Pictorial Rug, c. 1900, 73" x 42"
Large Navajo Teec Nos Pos Tree of Life Pictorial Rug, c. 1930, 134" x 66"